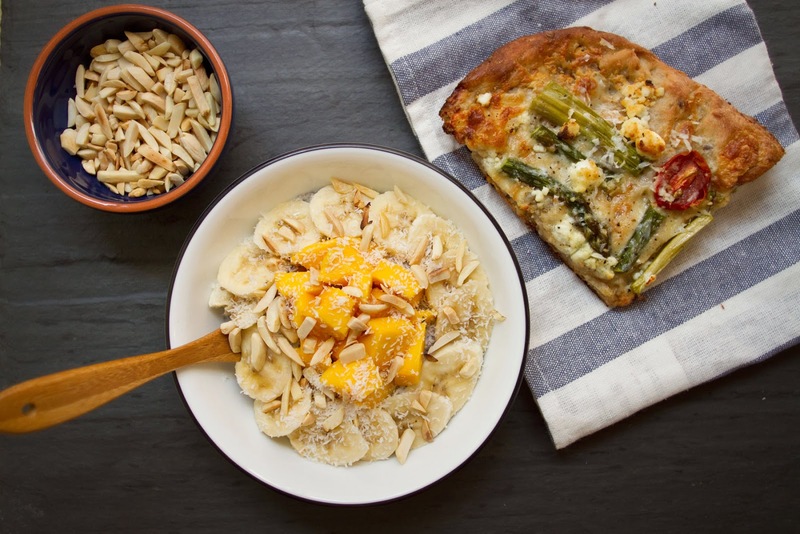 "Ramp season is here!" 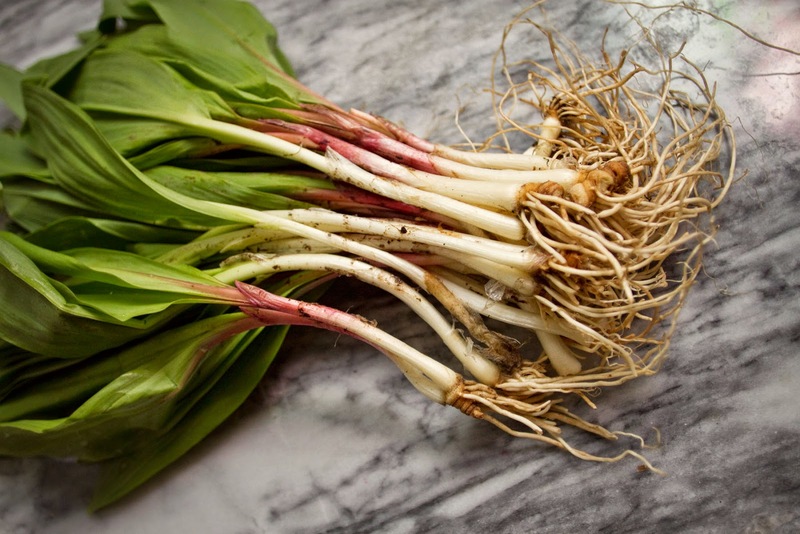 I shouted, bursting through the front door and barreling past the kitchen into the living room, where I triumphantly thrust my hefty bunches of ramps, one in each hand, into the air like the trophies they were. "Yeah! Ramp season!" S said enthusiastically, while our roommates looked bewildered by the sight of me, laden with overflowing canvas bags full of greenery from the market, thrusting leafy topped tangles of roots above my head in our living room. 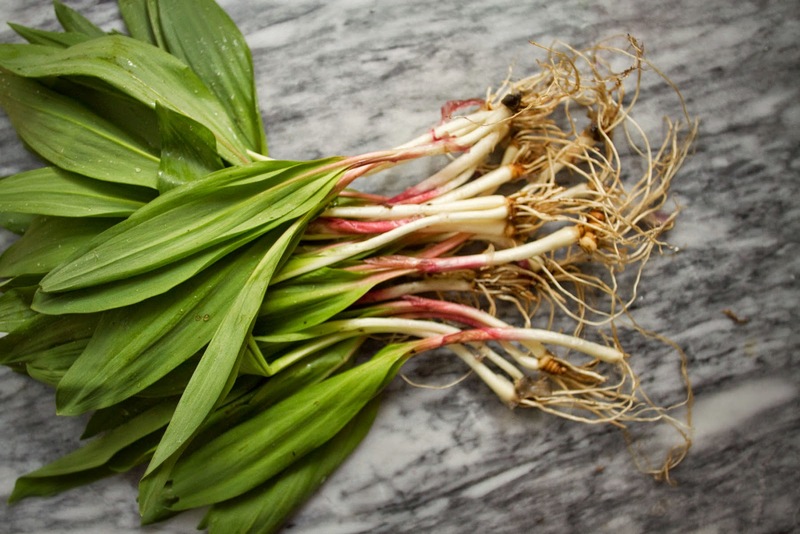 Ramps, Ramsons, or Spring Onions, are a lovely green little plant, with wide flat leaves growing above ground, and little white bulbs underneath, both parts are edible. They grow wild, are primarily a foraged food, and have a very, very short season- from late April to early June here in New York. On Saturday I was working on a shoot near Gramercy Park when I noticed the Union Square Market was in full swing. I made a mental note to check it out afterwards, while quietly, at the back of my mind, without too much faith, hoping one of the stands might have one of my coveted springtime foods. 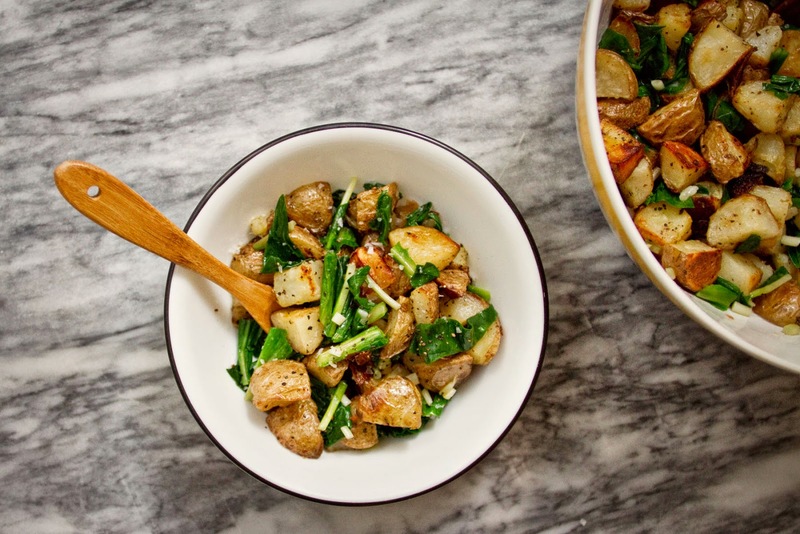 It's not just ramps with a short but delectable season occurring right now. There's also fiddlehead ferns, my absolute favorite foraged vegetable. Perhaps no taste reminds me of Washington State quite like the first bite of a crisp, perfectly sauteed fiddlehead freshly foraged from some shady fern-covered corner of the forest. Nearly every time I've eaten fiddleheads has been after I've found them growing wild, usually while not planning on foraging for fiddleheads at all, but occasionally they can be found at a farmers market. Then there are the garlic scapes. Oh, garlic scapes, my creamy, curly, pale green beau. I could write odes to the delicate, creamy, delightful taste of the garlic scape. So wonderful tasting, and so lovely to look upon. There were no scapes or fiddleheads to be seen at the market (it may be a bit early for scapes yet), but about halfway through my wander, once I had acquired some rainbow carrots and a large head of broccoli rabe (currently sitting on my counter, waiting to be blanched and sauteed after I write this), I came across a stand selling potatoes and gourmet potato chips, and while I was munching my way through each of their flavor samples, I noticed a pile of green things at the back of the tent. A pile of green leafy things. With pinkish stalks and white bulbs. Ramps! I immediately bought two bunches and hurried home to proclaim my excitement to S and our roommates. That night I made this dish. I've made a lot of claims about the simplicity of my recipes before but this may truly be the easiest recipe I have ever posted with the tastiest results. 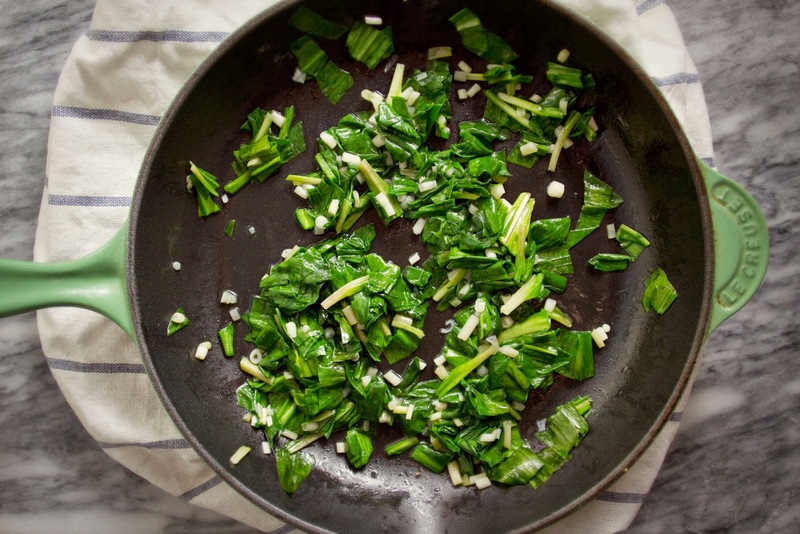 This is a lovely side dish, a, the ramps may look leafy and salad-y, but they pack a lovely sharp punch, reminiscent of young garlic, which reminds me of the spicy onion grass my neighbors and I used to pick and munch on in our backyards as children. 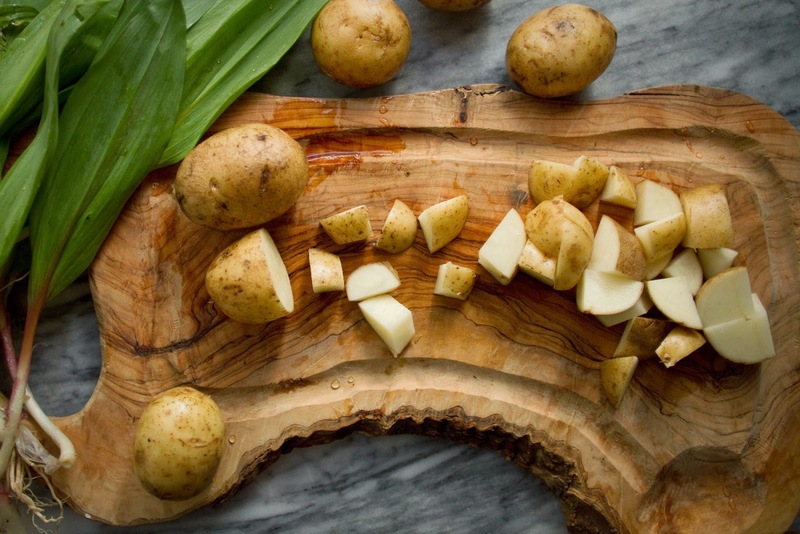 They're a lovely contrast to the creamy, crisp outside, soft inside new potatoes. 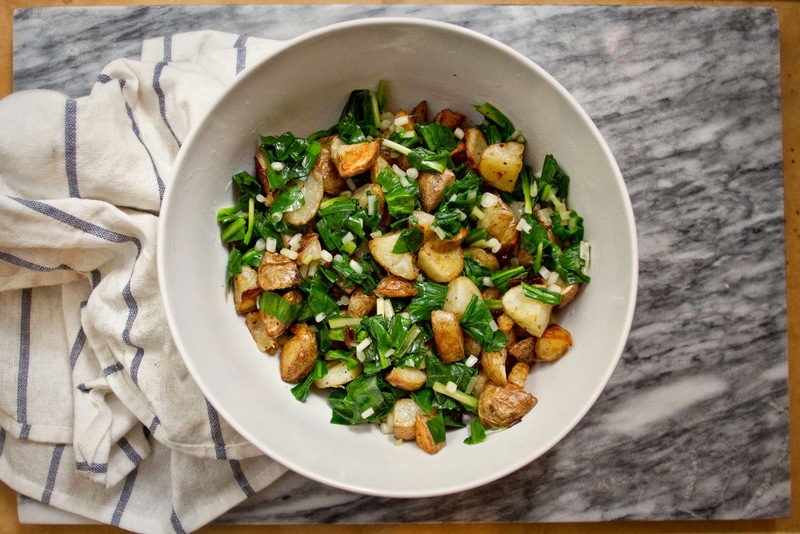 This is a fantastic spring dish, and a great accompaniment to lunch or dinner. 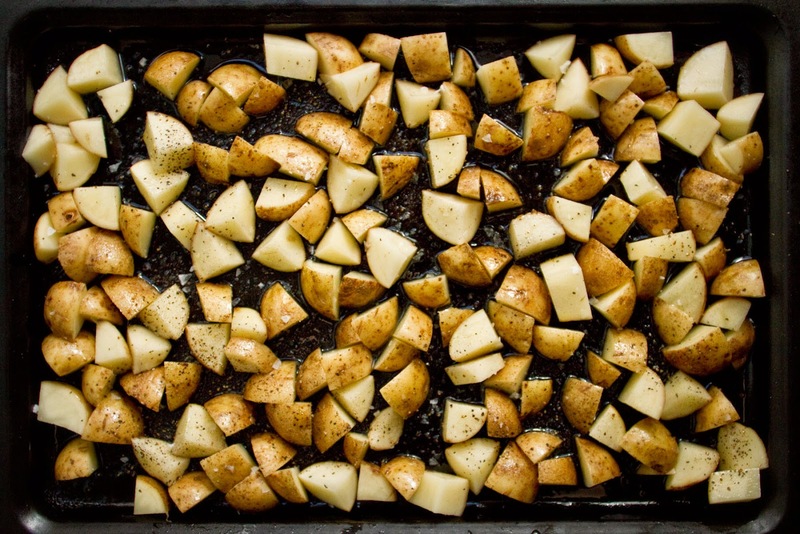 Chop potatoes into small 1/2 inch cubes, toss with 2 tbsp olive oil, and a sprinkling of salt and pepper. Spread out on a oiled baking sheet. Roast in preheated oven for 15 minutes, stir potatoes around, then roast another 10-15 minutes, until potatoes are golden brown and crisp on the outside. 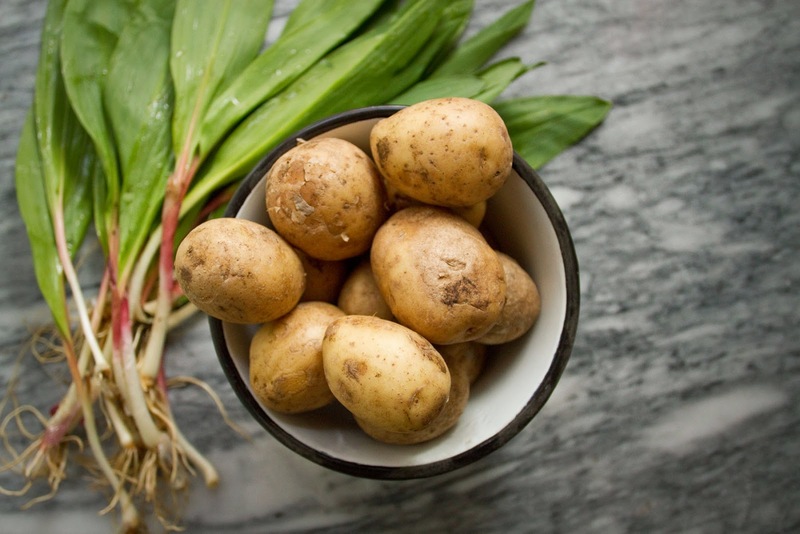 While the potatoes roast wash the ramps, cut off any roots and throw away, then cut the white bulbs off the green leaves, and save both parts. Chop the white bulbs. Early in the season these will be small and thin, simply cutting them in half will do. Later in ramp season the bulbs will be larger and rounder, like a small shallot, those you can chop a bit finer as they have a stronger taste. Cut across the leaves, slicing them into 1/2 inch thick ribbons. Keep bulbs and leaves separate. 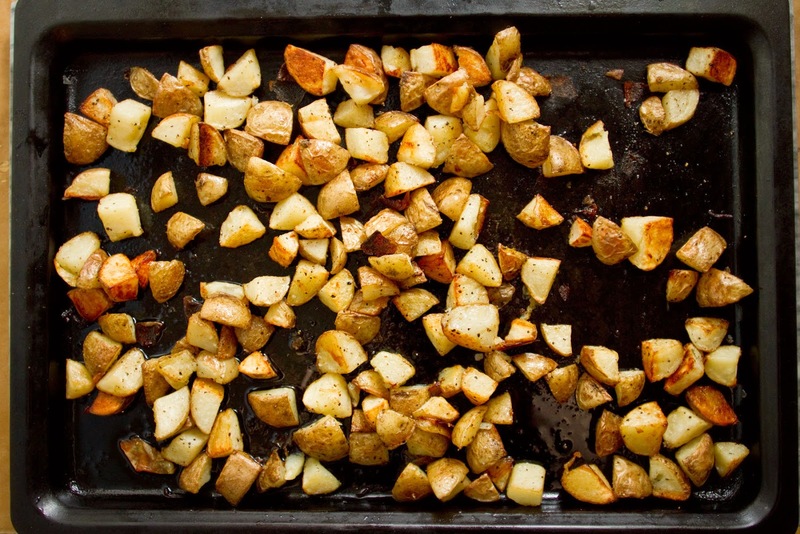 In the last 5-10 minutes of potato roasting, pour 2 tsp olive oil into a skillet and heat over medium heat, once the oil is hot, add the sliced up ramp bulbs and cook until transparent, about two minutes. Add the sliced ramp leaves and cook another two minutes until the leaves and bulbs are soft. 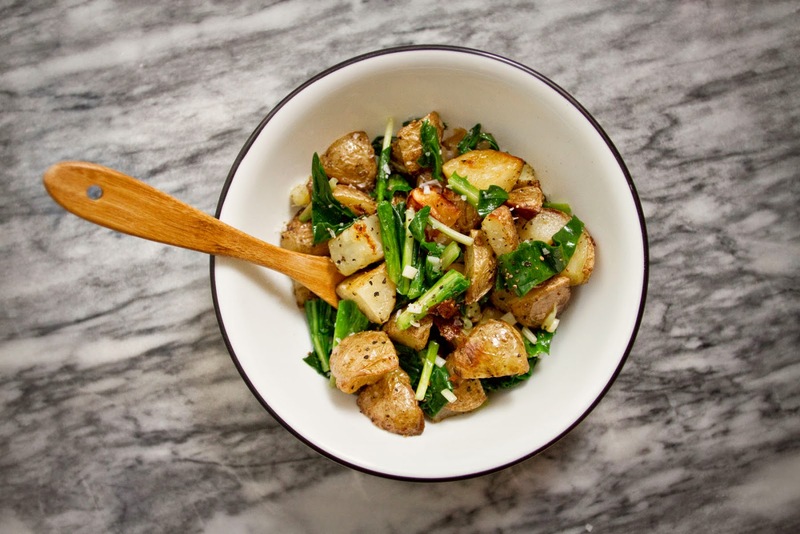 Remove potatoes from oven and transfer to a large mixing bowl, add the ramps and gently mix or toss to combine. Serve with a bit of coarse salt and fresh ground pepper sprinkled on each serving. Enjoy! For Valentines Day, way back in February, S took me to a restaurant on Mulberry Street called Tartinery. It was a lovely little spot and the Tartines, french open faced sandwiches, were amazing. Tartinery uses the famed Miche bread from Poilane bakery in Paris, which is supposedly the ideal bread for a tartine. I will not pretend to be a sophisticated type who has been to Paris and experienced a true french tartine, or a fresh slice of Miche in its homeland, but the smoked salmon tartine we had was heavenly, and the cucumber and labne one was nearly as divine. The filet mignon I devoured was not half bad either. I left that dinner knowing I wanted to make my own tartine, but I wasn't sure what ingredients I wanted to use. I knew I wanted to steer away from something traditionally french as I tend to like to put my American spin on everything. And I wanted to walk the fine line between lunch and snack, which is pretty ideal tartine territory. And then I got swept up in cooking other, also delicious things and it wasn't until the other day that I remembered my tartine aspirations. And then I thought of another holiday meal with S, at Locanda Verde for my birthday three years ago, and a lavender and burnt orange ricotta toast we had. 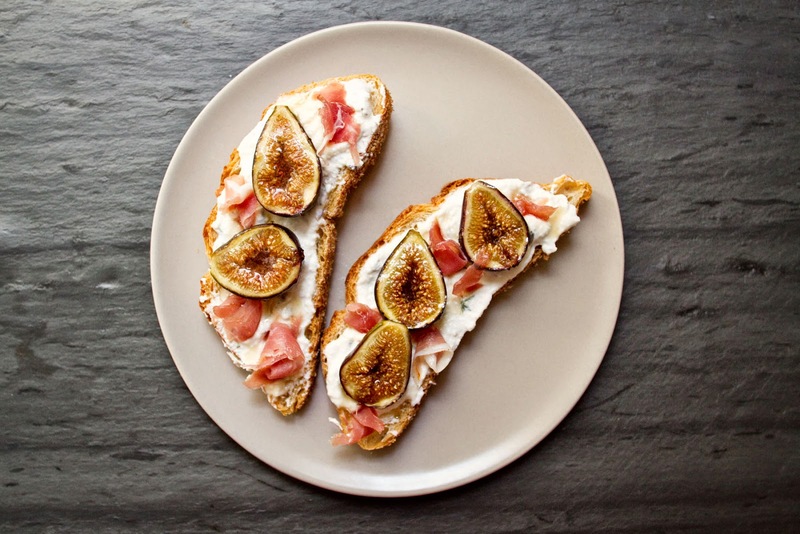 I put two and two together, and here you have a ricotta and fig tartine with thyme and lavender. I did not use the famous Poilane Miche, though I've heard if you jump through the right hoops on the right days a loaf, or atleast of portion of one, can be all yours right here in New York. Apparently there is a list, and a call you're supposed to receive if you're on it, and a particular day of the week you pick it up on, if the call comes in, which apparently it frequently doesn't, and then if you make it to the bakery before it's all sold out, and I think I'll stick to enjoying the miche based tartines at Tartinery. I used a regular old loaf of sourdough from Whole Foods, but I recommend finding the largest loaf of bread you can, preferably one of those round boule loaves. If you're in New York City, Orwashers sells a really great chardonnay miche that is a pretty good approximation. I pick mine up at New Amsterdam market, but seeing as it's not yet the season for that market, I had to make due with my Whole Foods loaf, which was still super tasty, so I don't think you have to be picky about which bread you use. Just use what you like. 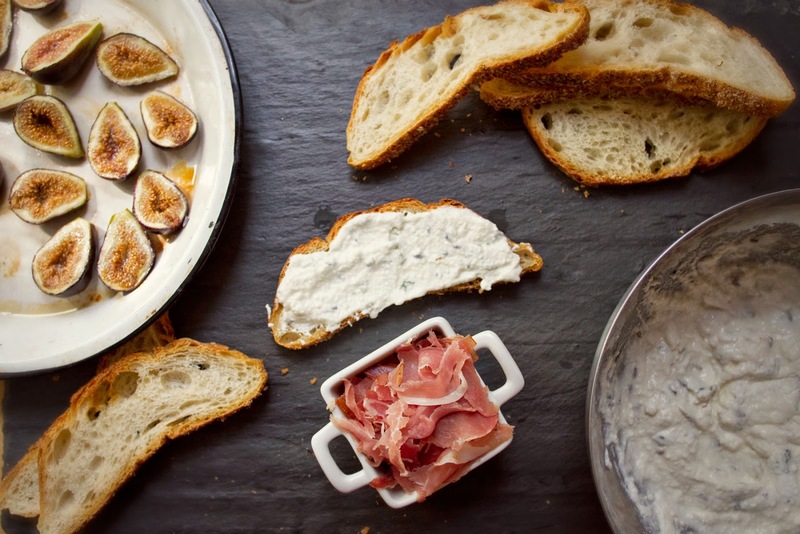 The ricotta is infused with thyme, and lavender, as is the honey drizzled over top of the fig and prosciutto covered tartine. 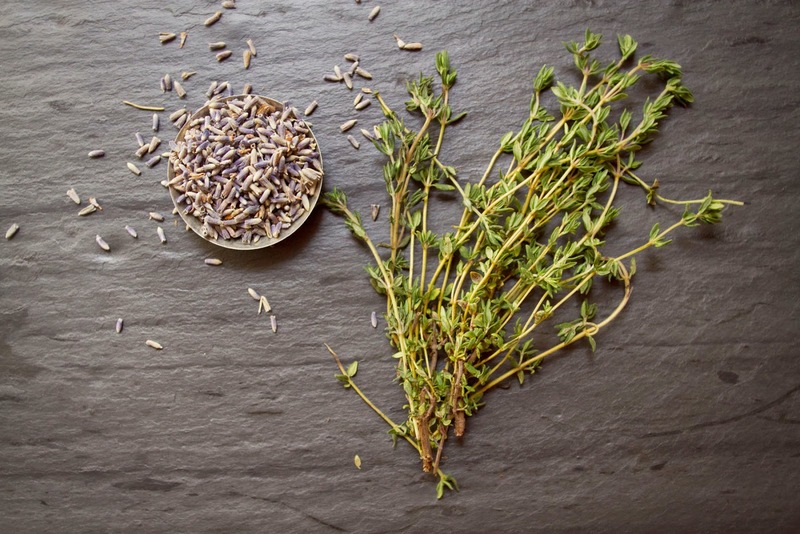 The herbal thyme and floral lavender give it a faint but slightly sharp note, and an added complexity that is just lovely paired with the earthy sweetness of the honey butter roasted figs. S and I ate these for lunch when I made them, which was delightful, but I think they're also wonderfully suited to being appetizers at a cocktail or dinner party, or part of the meal at a brunch or lunch party. It could very easily be doubled to serve larger parties as well. Enjoy! Makes 4 large tartines or 6 small ones. 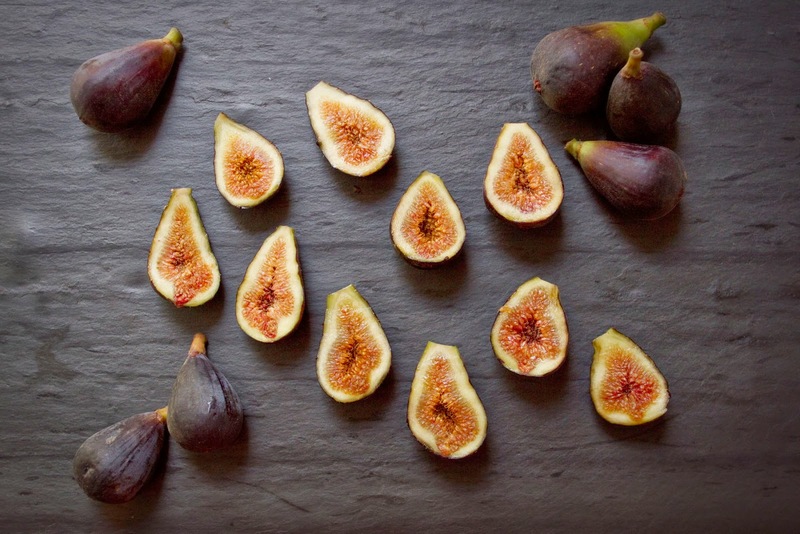 Cut the figs in half length wise and place on a baking sheet or in a shallow baking pan, cut side up. In a small bowl combine the butter and 1 tbsp of honey, melt in microwave on 1/2 power for 25 seconds or in a warm water bath and mix to combine. 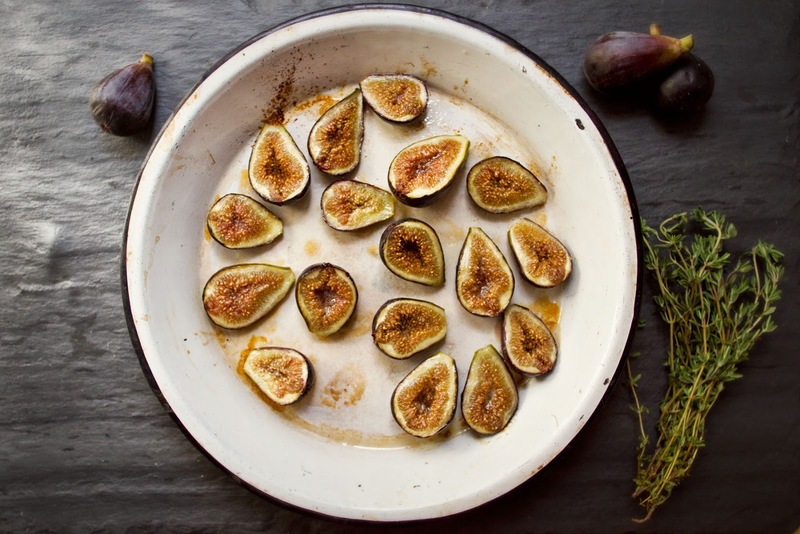 Brush mixture over each fig, and roast for 10-12 minutes, until figs are soft and roasty. 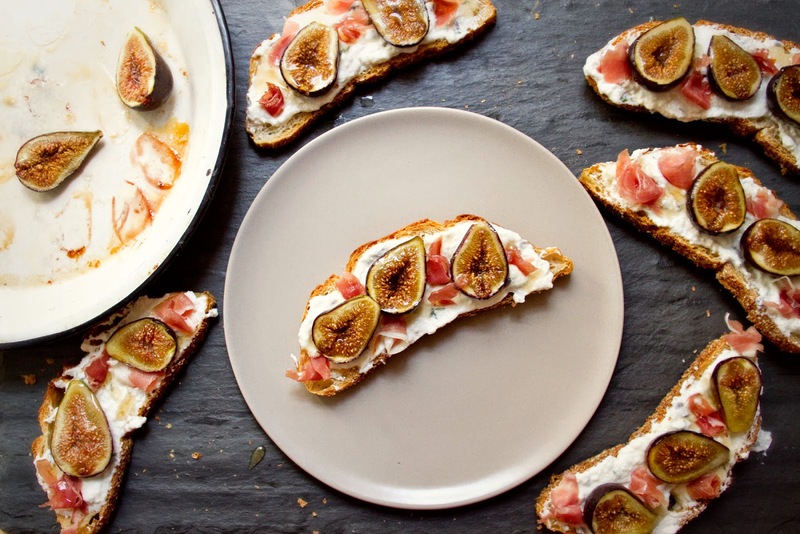 If you'd like to toast your bread, leave oven on after removing figs. 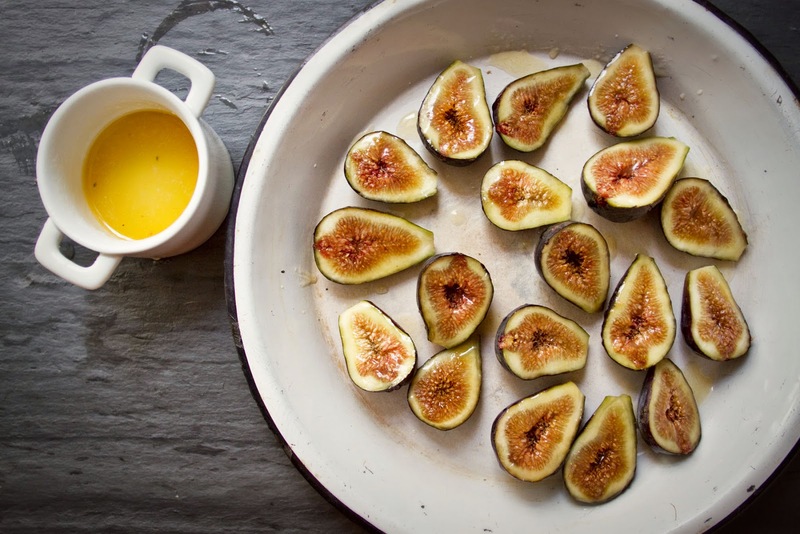 While figs are roasting, combine 1/3 C honey with thyme, and lavender in a small sauce pan and heat over low heat for 3-5 minutes, until thyme and lavender flavor has soaked into the honey. 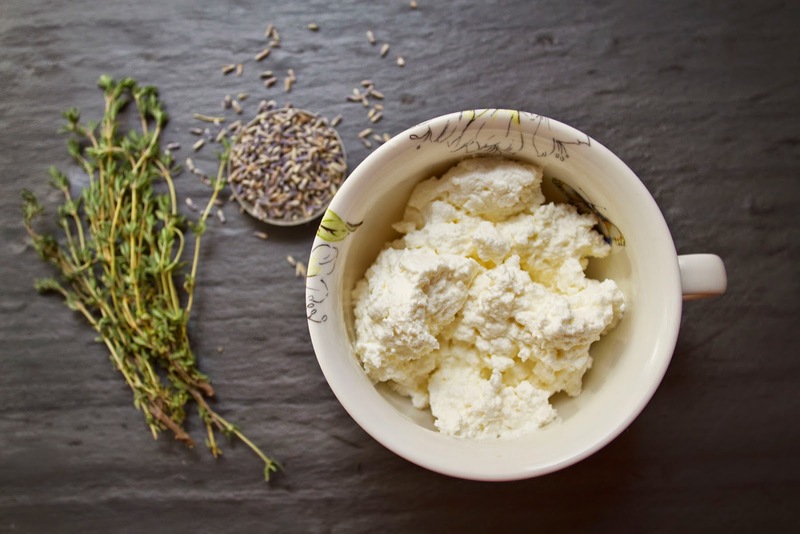 Place ricotta in a small mixing bowl and pour 1/2 the honey and herbs over it. Mix well. 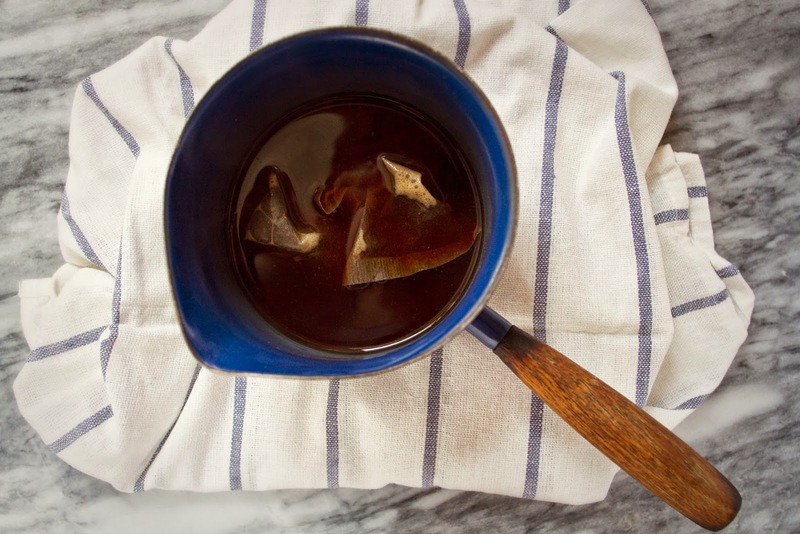 Strain the second half of the honey mixture through a fine mesh sieve into a small liquid measuring cup, set aside. If you'd like to toast your bread, pop the slices into your preheated oven, directly on the rack for 2-3 minutes, until lightly toasted. If your bread is super fresh and soft and lovely, you don't have to worry about toasting it if you prefer it soft. 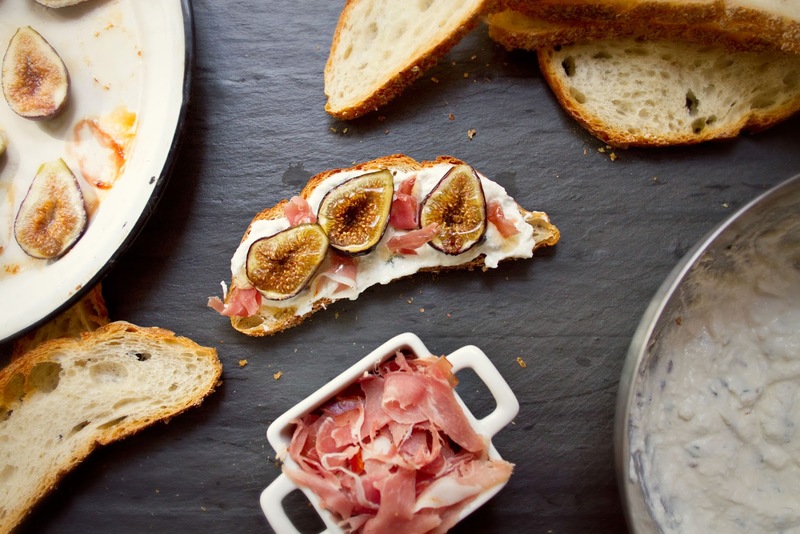 Chop your prosciutto up into little strips and bits about 3/4 of and inch long. I don't worry about mine looking uniform, rustic tartines look lovely. 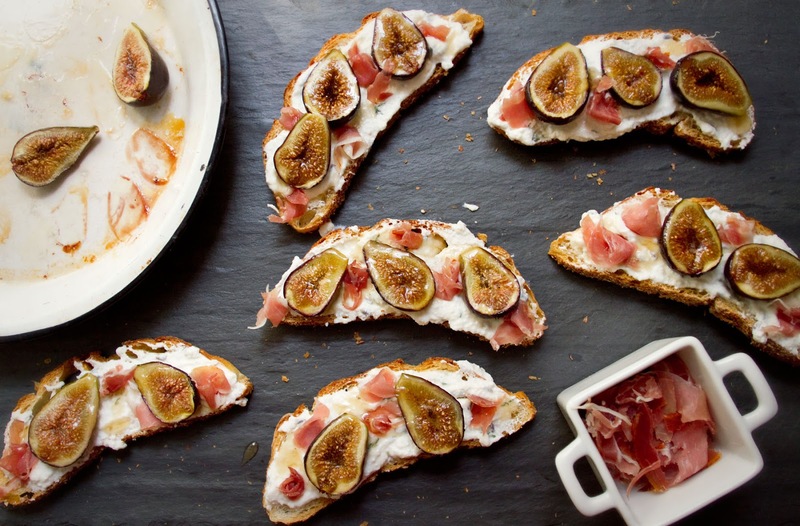 Spread the ricotta thickly onto the bread slices, top with roasted figs and bits of prosciutto, then drizzle a bit of the strained honey mixture onto each one. If the honey has thickened too much to pour, just warm it up a bit over low heat. I try not to feature any one ingredient too heavily on this blog. Much like at my dinner parties, I try to steer away from repetition, and produce something new with every dish. I'm pretty sure some of our friends who eat in our apartment regularly have begun to think I have some sort of endless well of varied recipes in my head. But in our day-to-day cooking and eating, there are certain ingredients, foods, and themes that reoccur regularly. Chia seeds are one of them. While I've only posted one other chia recipe to this blog, S and I enjoy chia desserts pretty regularly. There are a glut of chia recipes out there already, but I frequently nix the idea of a recipe in favor of putting together a pudding from whatever I already have in the house. That's the beautiful thing about chia seeds- they're very versatile. 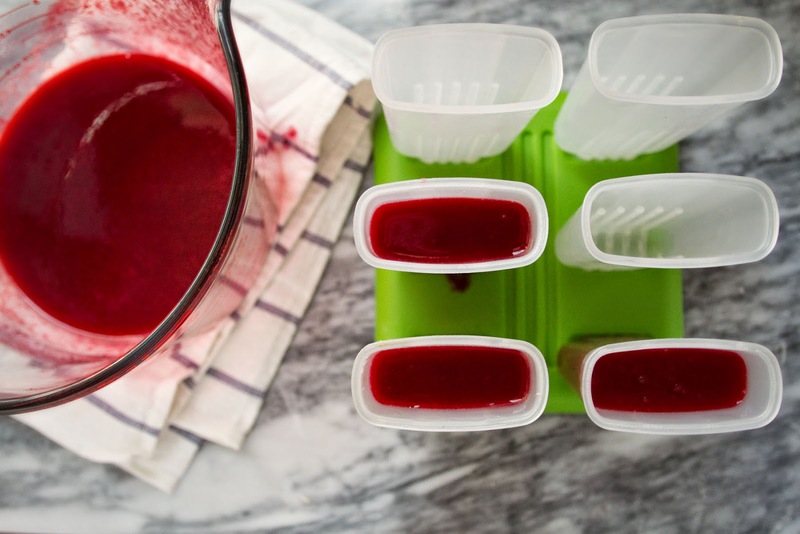 They'll soak up any kind of liquid you pour them into, and varying the amount can produce everything from smoothie, to jam, to pudding consistencies. They're also tasteless, so you can add them to just about anything you like the flavor of to make a pudding. 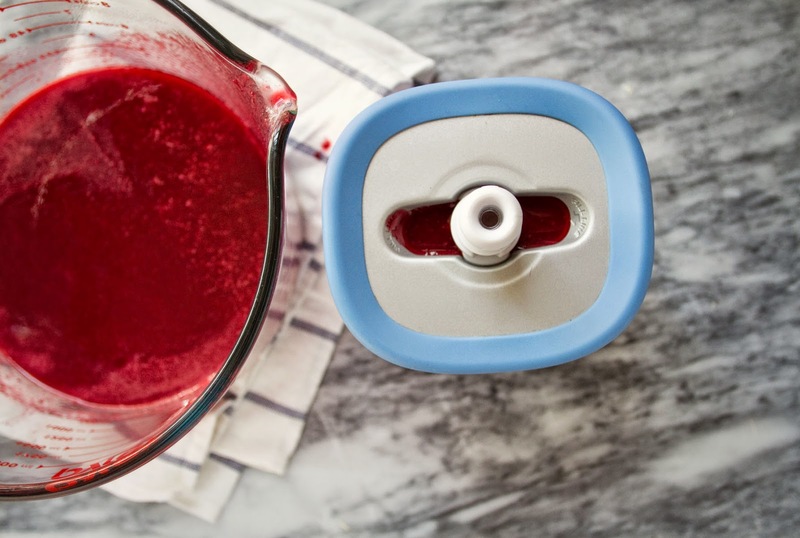 They're great with coconut milk, or almond milk to make pudding, fantastic in juice to make a chia fresca drink, great with mashed berries to make raw jam, and taste great topped with just about any combination of fruit. So consider the recipe below a backbone or a jumping off point. You can change up the sweetener, add a little fruit juice to change the flavor, top it with granola, or with different fruits (perhaps kiwi and pineapple, or berries and melon), toasted sesame seeds, muesli, whatever you like! 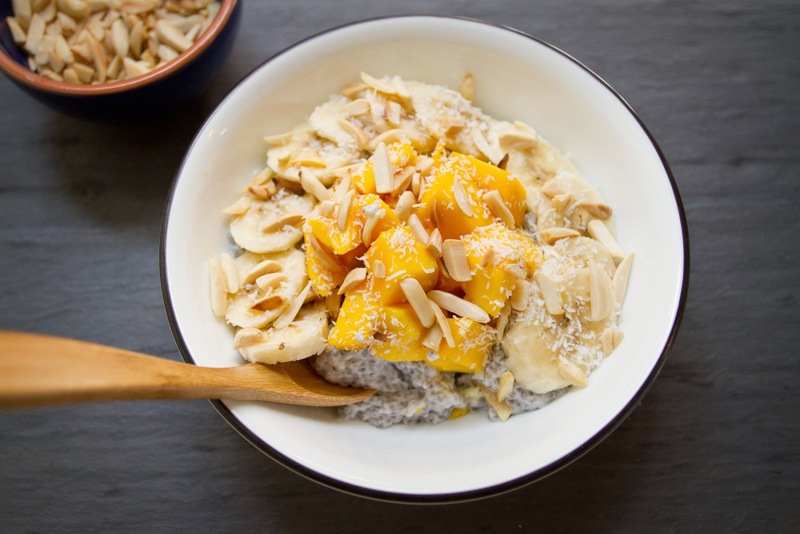 The beauty of chia pudding is its simplicity and adaptability, so experiment away! If your coconut butter is cold and rock hard like mine was, put it in a little bowl and microwave it about 20 seconds at 50% power, or pop it in a bath of warm water until it softens. Add coconut butter to a large bowl or container with a lid (don't put the lid on yet though), and stir in the maple syrup and almond extract until smooth and well combined. Add about 1/2 C coconut milk and mix until the coconut butter/maple is thoroughly mixed into the coconut milk. Add the rest of the can of coconut milk and mix well. 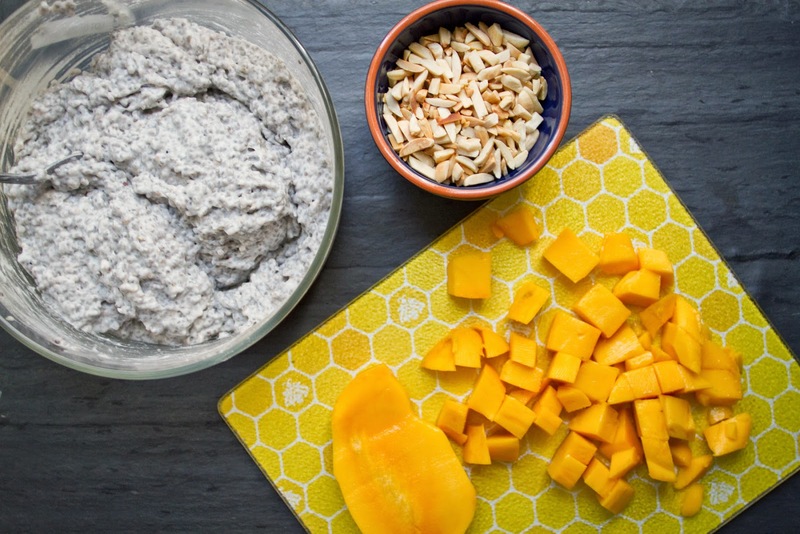 Whisk in the chia seeds, pop on the lid and refrigerate at least three hours, or overnight. Overnight is ideal for breakfast usage. 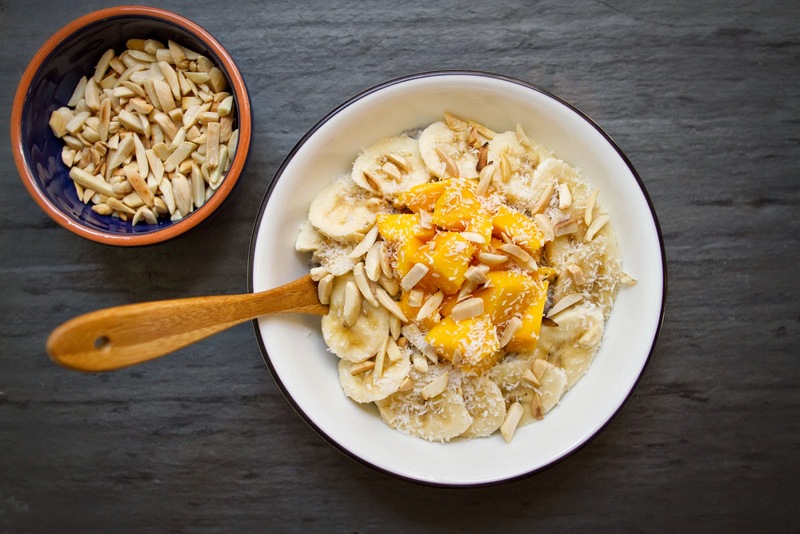 Add the almonds to a small, dry skillet, and place over medium-low heat and stir often. Don't take your eyes off the almonds, and ideally slowly stir these the whole time as when they start to toast they can burn quickly. Also moving and turning them will help them toast evenly. Cook for 4-5 minutes, until the almonds begin to turn pale brown and smell toasty. As soon as the almonds go from ultra pale beige to toasty light brown, remove pan from heat and continue to stir almonds for about 1 minute, to finish off toasting. If you smell anything burning, dump the almonds out onto a room temperature plate to help them stop cooking. Set the almonds aside. When I'm having this for breakfast I do all my chopping in the morning right before I eat the pudding, but theoretically you could cut up the mango the night before and toss it with a bit of lemon juice, then keep it in the fridge until the morning, but I think I would hold off on cutting the banana until right before serving because old sliced banana is slimy. Peel and chop the mango into about 1/2 inch cubes. 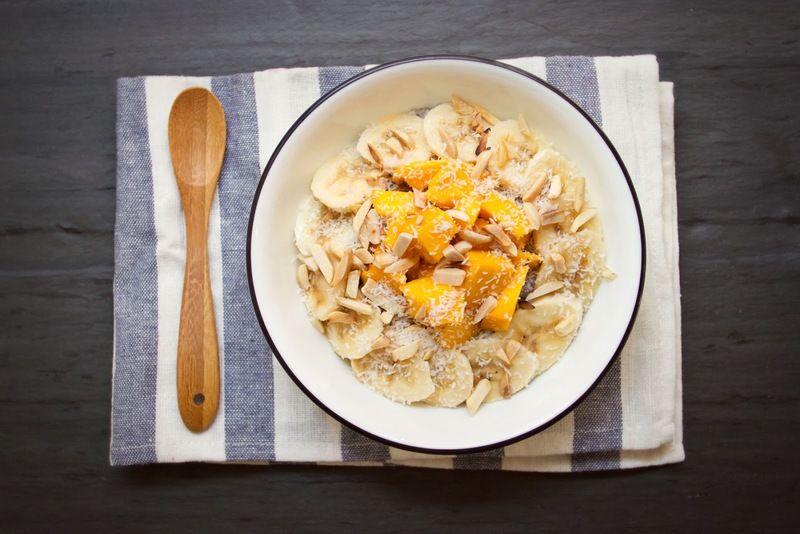 Peel the banana and cut into thin slices. 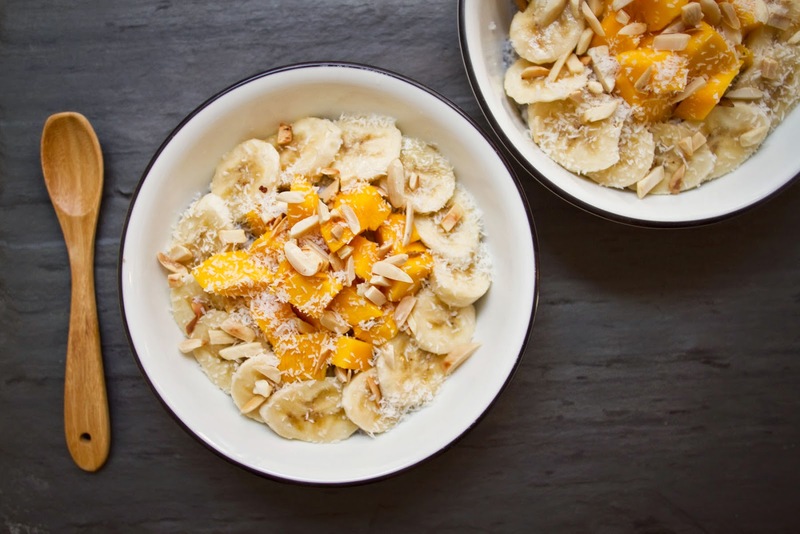 Take the lid off the pudding, give it a stir and spoon into bowls, top with the banana and mango, then sprinkle with the toasted almond and shredded coconut. Enjoy! *The coconut butter is optional, as it isn't integral to the success of the recipe, so if you don't like/are allergic to coconut, or if you don't want to buy a whole jar for one recipe, then you can omit it without any replacement. It makes the pudding a bit creamier and also a bit stiffer, and generally bulks it up a bit, but I have made many chia puddings without it. 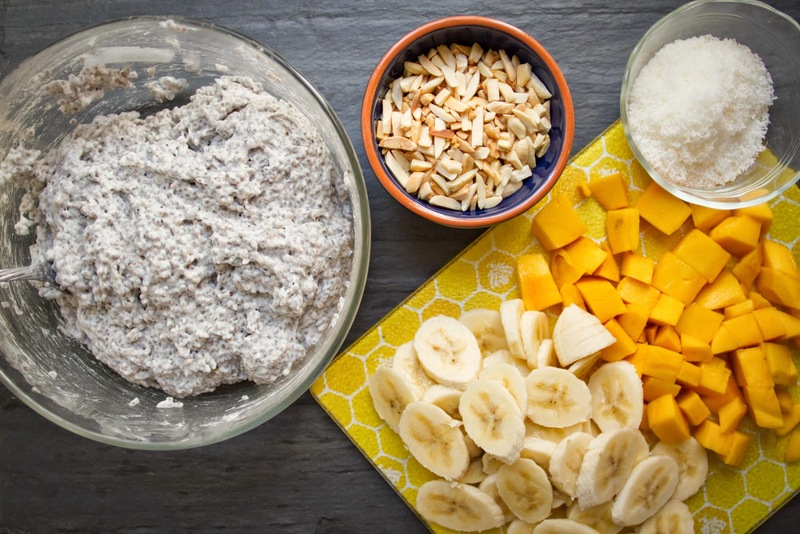 If you'd like a thicker pudding without adding coconut butter, then add an extra 2 tbsps of chia seeds. These pops were one of those dishes I sort of stumbled into, or perhaps I should say one of those dishes I got pulled into by the current of cooking and life. I live in Manhattan, where many of the grocery stores are stuffed absolutely to the brim with convenience foods- prepared refrigerated meals, frozen meals, take out sushi, a dosa bar, a salad bar, a soup bar- these are all things my local Whole Foods has. But when it comes to fresh produce, your average Manhattan grocery store tends to slack a bit on the selection. Even Whole Foods, considered the pinnacle of New York grocery store options, second only to Fairway, tends to have an iffy selection. If you want very popular produce like apples, or strawberries, or green beans they'll have that. And certainly all of their produce is lovely and ripe, but I once went to two Whole Foods, and then to another grocery store in search of cauliflower, only to be forced to give up on my plans for roasted cauliflower because it was no where to be found. Last weekend I wanted to make popsicles. It was finally warm and sunny, and popsicles felt like the right way to ring in Spring. 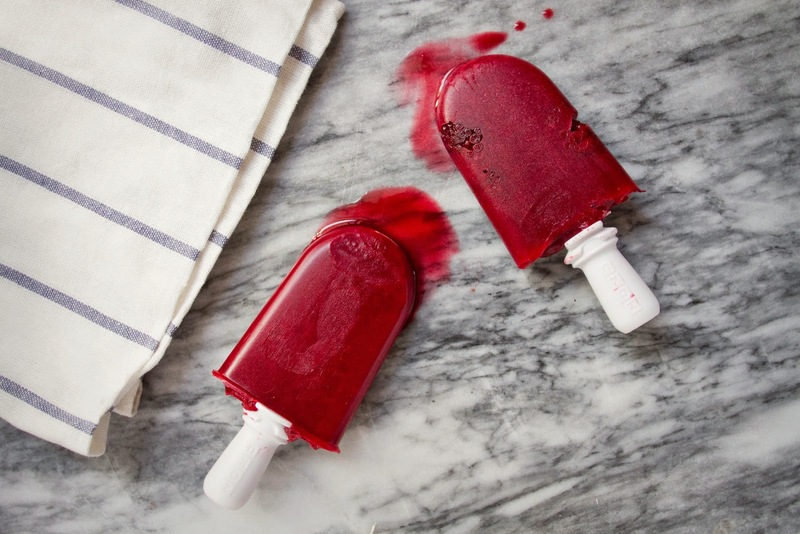 S suggested pomegranate-lime popsicles with pomegranate arils in them, and I thought with a bit of coconut milk that sounded like a fantastic plan. But finding a pomegranate proved impossible. I went to two smaller, local grocery stores only to find there were no pomegranates. So I stepped up my game and went to Whole Foods after brunch on Saturday, where after searching the produce section, I gave up an asked one of the stockers. He walked me over to the refrigerated section of produce, where they keep all the really expensive pre-cut produce, like the 7 dollar pints of pineapple whose price tags gave me major sticker-shock in college when my roommate would buy them, and he showed me a 1/2 pint container of pomegranate arils, all neatly removed from the pomegranate and packaged up. They were 9 dollars. Obviously, I couldn't do it. Not only was the price a major blow, but there was no way I could bring those home and photograph them without the lovely pomegranate they're supposed to be inside of. Besides, convenience food like that, foods that could easily be made anyway but cost over three times as much because the grocery store de-ariled your pomegranate drive me crazy. I just can't buy them. "Lets go look at the berries instead." I said to S. In the end an entire pint of blackberries was $2 dollars cheaper than a 1/2 pint of pomegranate arils. Which meant they were still crazy expensive, but at least less so. And they were American grown. I started brainstorming about what to replace the coconut milk with, now that I was using blackberries. I thought about pear juice, but I don't like to use too many fresh juices in my recipes as not everyone has a juicer, and I know how frustrating it is to not have a key piece of equipment for a recipe, every time a recipe calls for a high powered blender or Vitamix I think of my aging Oster blender bought in college, and the hot plastic smell its motor gives off just trying to turn frozen raspberries and coconut milk into a milk shake, and move on to another recipe. And then I remembered my favorite Blue Moon sorbet, Blackberry Lime, and the way it tastes faintly of tea, despite not having any actual tea in it. 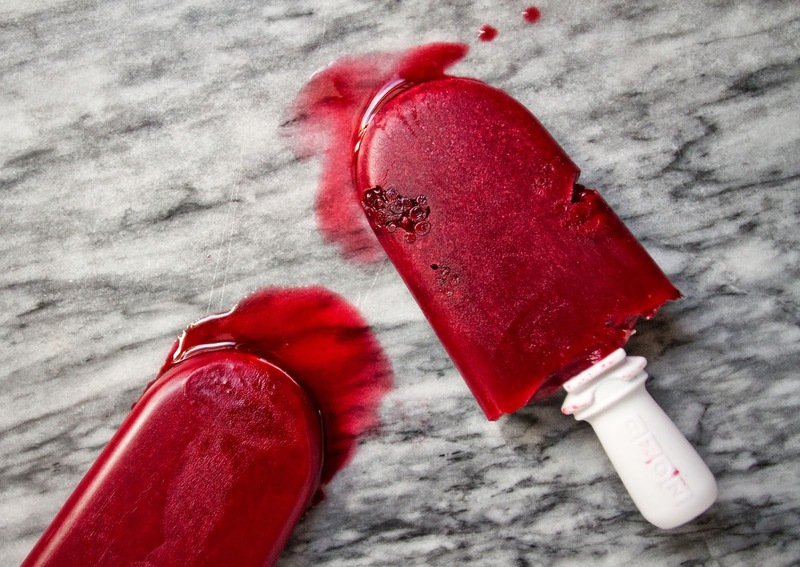 I love the deep, dark tea undertones in the sorbet, so I figured I would probably love them in popsicles. And using actual tea would definitely make the flavor pop. Plus I always have black tea in the kitchen because S and I use it to brew Kombucha. The tea proved to be an excellent idea, and these pops are amazingly addicting. Sweet, a little tart, and lightly spiced with black tea, which means they also have a little pop of caffeine, in case you're into a bit of an energy boost with your dessert. Enjoy! In a small saucepan, bring water to a boil and add the teabags. Allow to steep for about 5 minutes. Remove tea bags, return tea to low heat and add the sugar. Cook over low heat until the sugar is dissolved. 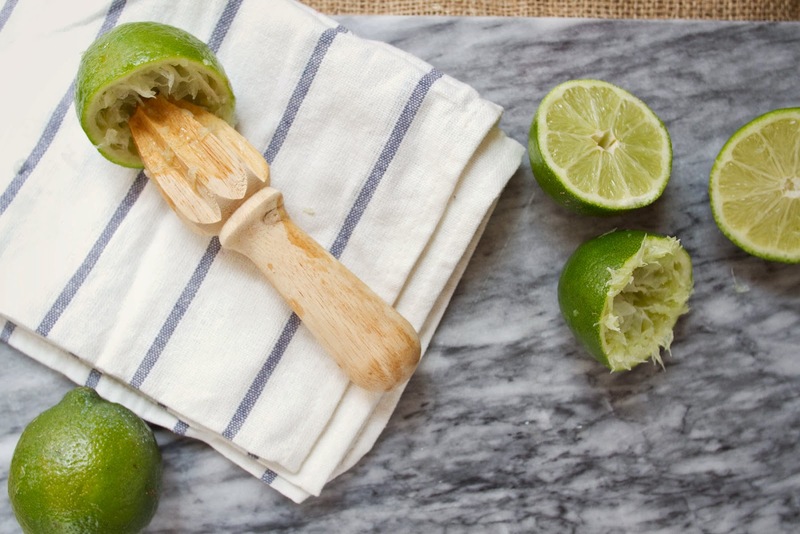 Juice the limes, remove any seeds. 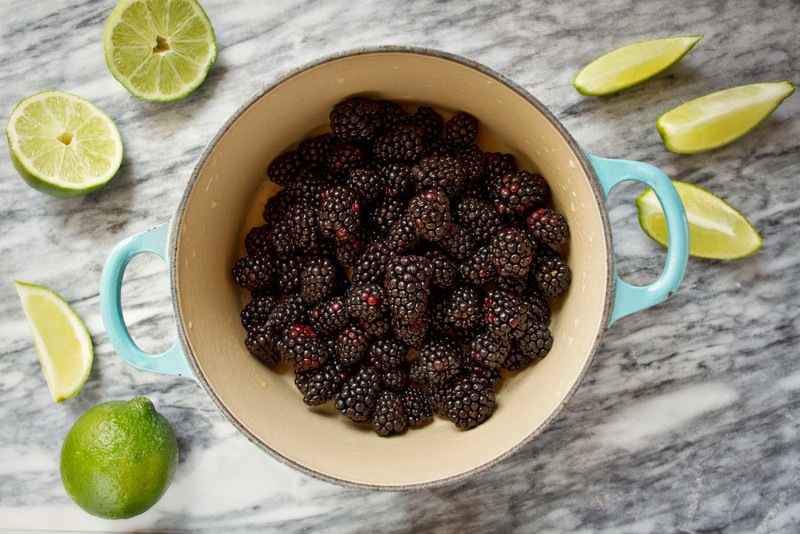 Add the lime juice and the blackberries (feel free to set some aside to add to the pops whole) to another sauce pan, along with the honey. 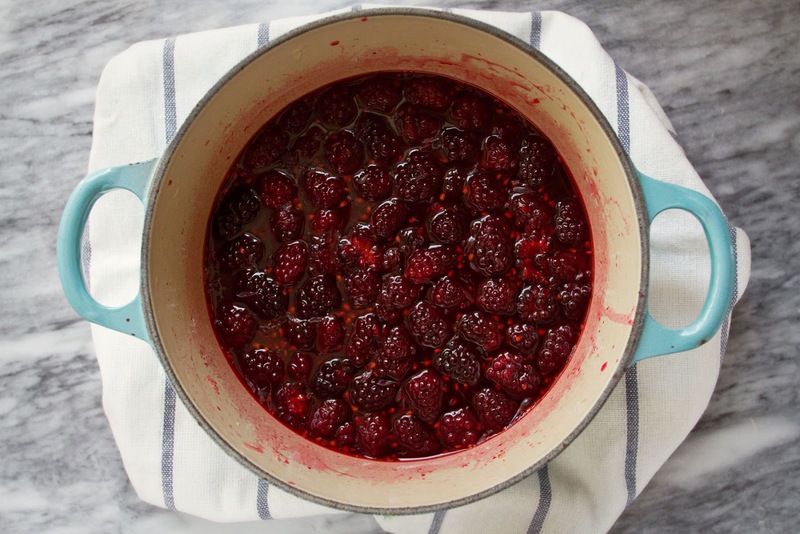 Cook over low heat, stirring and occasionally mashing the berries for about 4-6 minutes, until the juices are dark purple and the berries are beginning to break down. 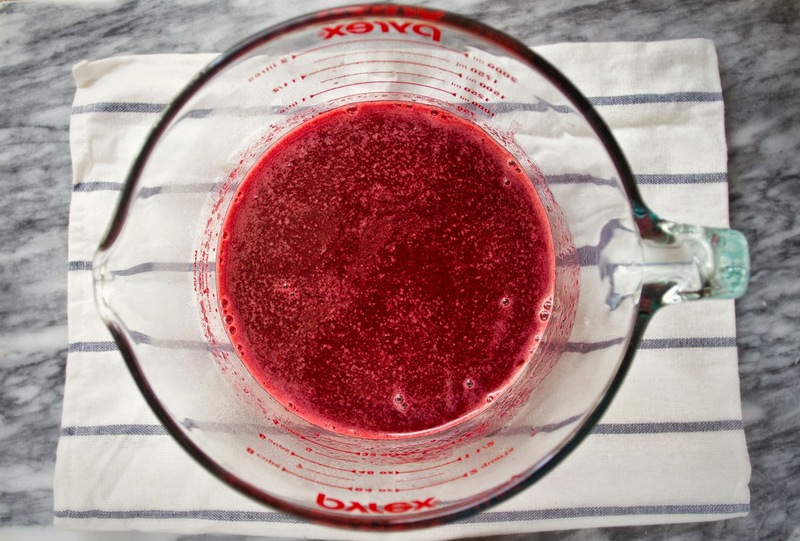 Pour the blackberry mixture and the black tea mixture into a blender and blend until smooth. 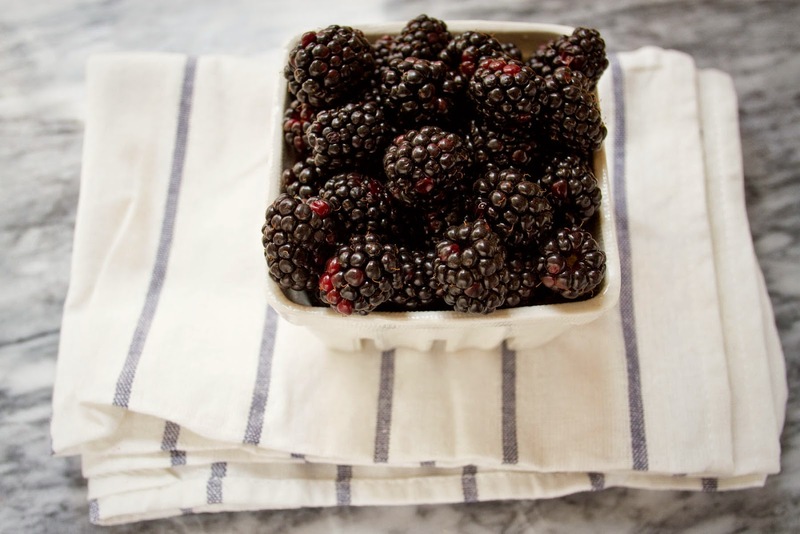 Place a fine sieve over a large measuring cup or bowl and pour the blackberry mixture through the sieve to remove the blackberry seeds. 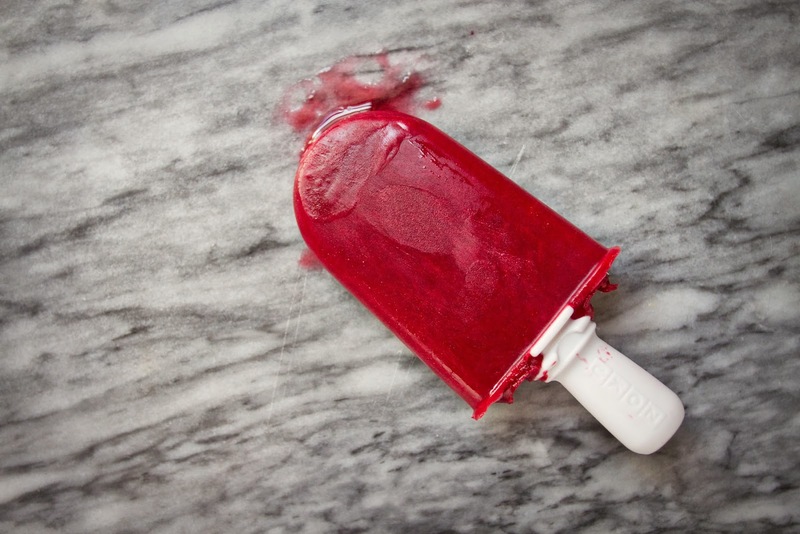 You can make these pops in traditional popsicle molds, or in a Zoku pop maker, like I did in these photos. I made some the old fashioned way as well, and after about 8 hours they were frozen solid and ready to eat. I ran my popsicle mold under water for about 45 seconds to make removing them easier. *This is an estimate, I actually made 4 traditional pops and 3 Zoku pops. 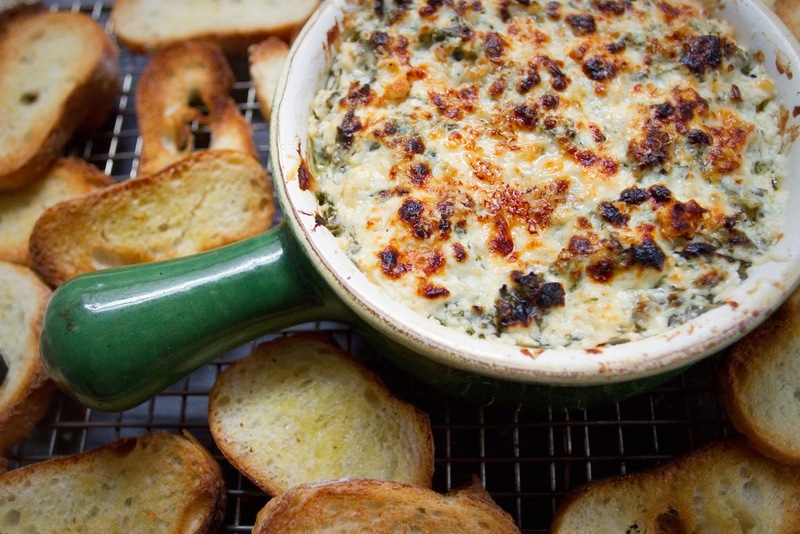 This dip is heavenly. I had the idea for it while scavenging in the kitchen for something to put on a leftover baguette. 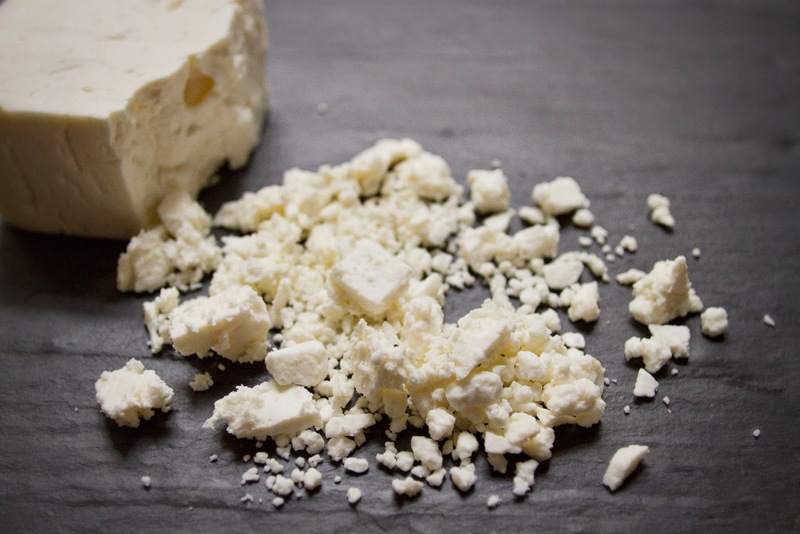 I could only find feta and olive oil, so I melted the feta in a bit of olive oil, microwaved it, and we gobbled the lumpy, bubbly mixture up on our day old baguette. The snack was delicious, but a bit oily and salty, so I started thinking about how I would improve the feta dip, if I made it again. First I thought of greek yogurt, then S thought of cream cheese. Then I realized the answer was to use both. Somewhere along the line I decided to add roasted garlic for its warm, rich flavor, and kale because I pretty much think kale goes in everything. And then I baked it instead of microwaved, so it would get all beautiful and brown and toasty on top. If you're wondering where I was last week, I took a short hiatus to celebrate my 26th birthday by going skiing in Vermont with my father. It was fantastic, we had some great bluebird days, not a cloud in the sky, and some incredibly cold and windy days, and one really foggy and rainy day, but we skied through it all. At a little restaurant in Manchester, VT, we had a curry-goat cheese dip one night, which came with eggplant fries. Typically I do not like eggplant, but this was deep fried eggplant, so I was willing to try it. The eggplant fries turned out to be amazing. The dip was good, it tasted quite a bit like Chicken Makhani sauce, but the eggplant fries stole the show. They were crispy on the outside and hot and soft inside, and not too eggplant-y. I bet they would be super tasty with this dip. 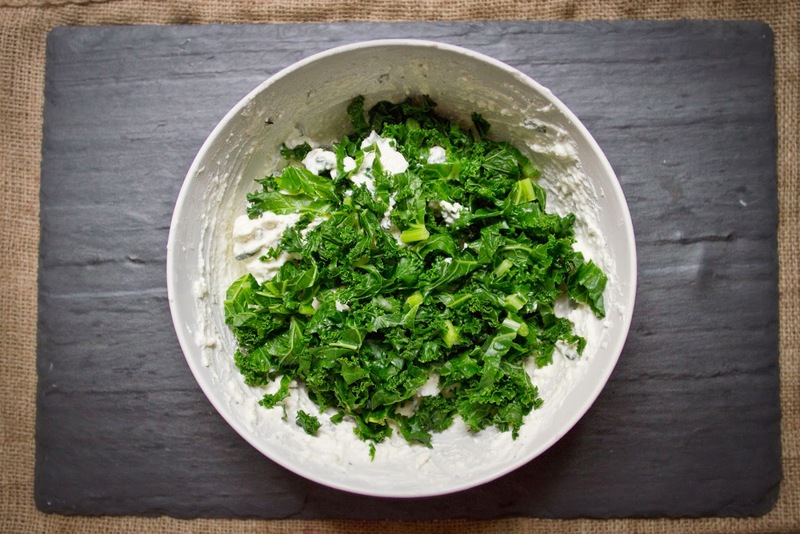 You could dip a lot of things in this kale-feta dip. Sliced baguette, toasted pita strips, carrot sticks, falafel chips (have you tried falafel chips? they're awesome), or pumpernickel bread. What else would you try? I bet it would be great on some of those fancy seeded crackers everyone is into lately. S and I debated what we wanted to eat the dip on, I said toasted pita, he said baguette. He won because baguettes are so delicious and perfect I can never resist the allure of french bread. I toasted my slices a bit to make them sturdier and easier to dip. I recommend this, especially if you're serving the dip to a party. 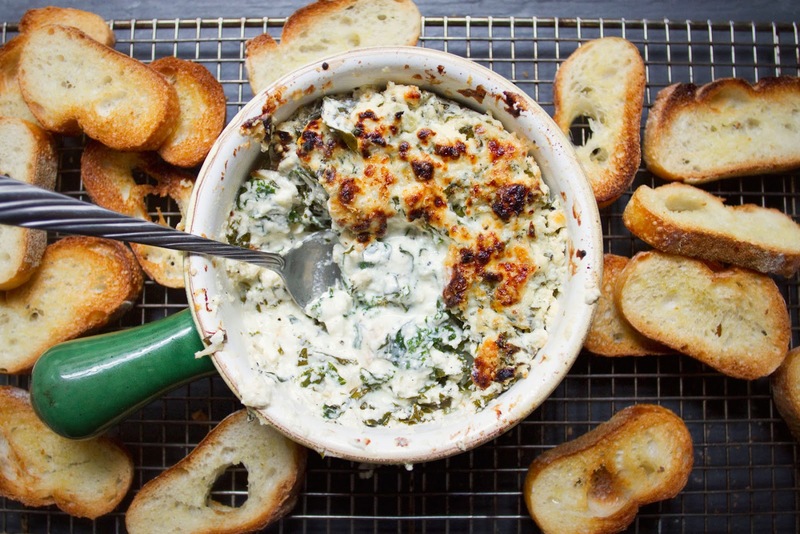 This dip would make an excellent appetizer at a dinner party, finger food at a cocktail party, and goes great as a game night snack (are there any sports on this time of year? I don't even know). Or, be like S and I and just eat it as a side dish at dinner. We had it at two different meals and in between popped the leftovers in the fridge, it warmed up just fine being put back into the oven. Enjoy! Begin by roasting the garlic. Preheat the oven to 400 degrees fahrenheit, place the garlic on a cutting board and cut off just the top of it, revealing the tops of each clove. Wrap in aluminum foil and place in the oven for 45 minutes to an hour. While the garlic roasts blanch the kale. Place a large pot of water over high heat to bring to a boil. 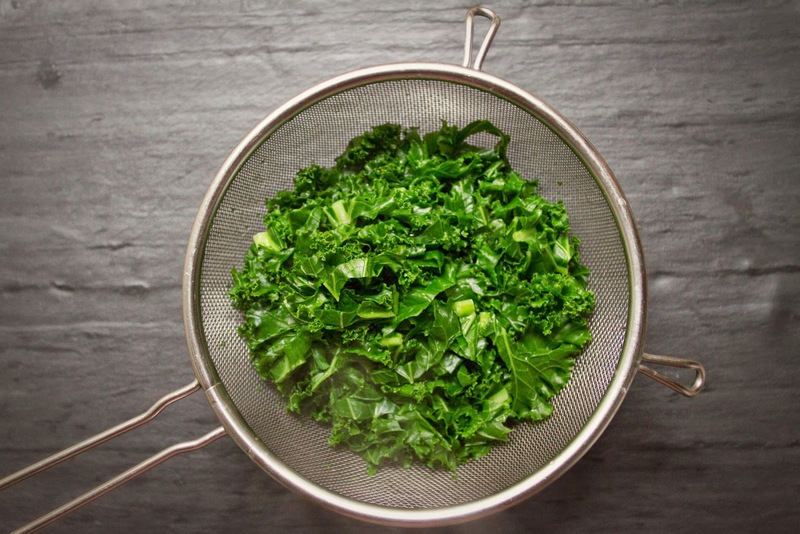 Wash kale, remove the rib from the middle of each leaf, then slice thin. I do this by stacking my de-stemmed leaves and rolling them up, then cutting across the roll. 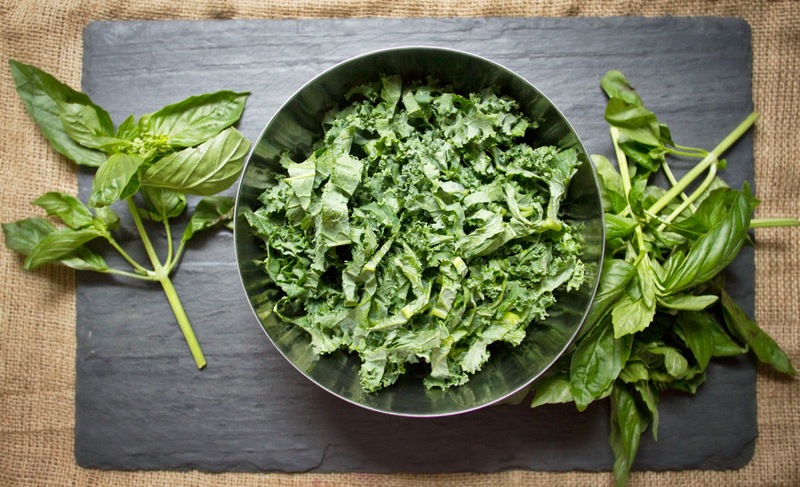 Once water is boiling, dump all your kale in it and mix it around for about 20-30 seconds, then drain. Do not over blanch the kale, it will cook more in the oven. 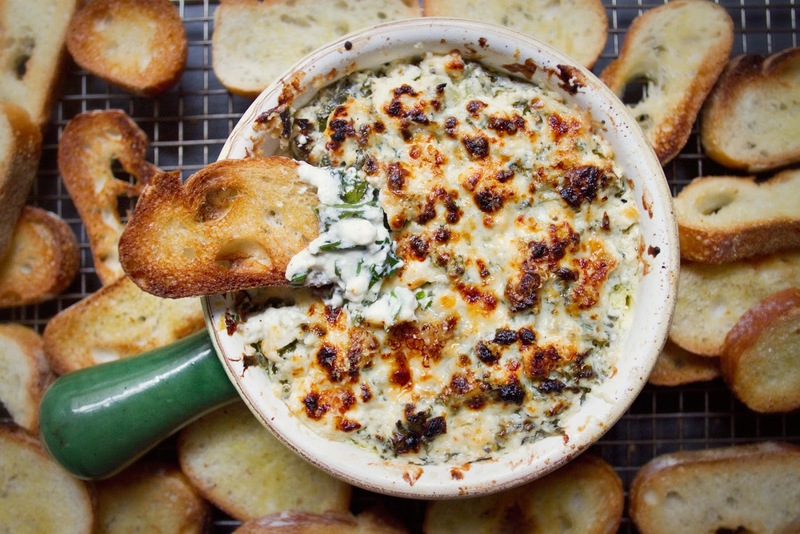 Allow kale to fully drain while preparing the dip. You want it fairly dry when it goes in. 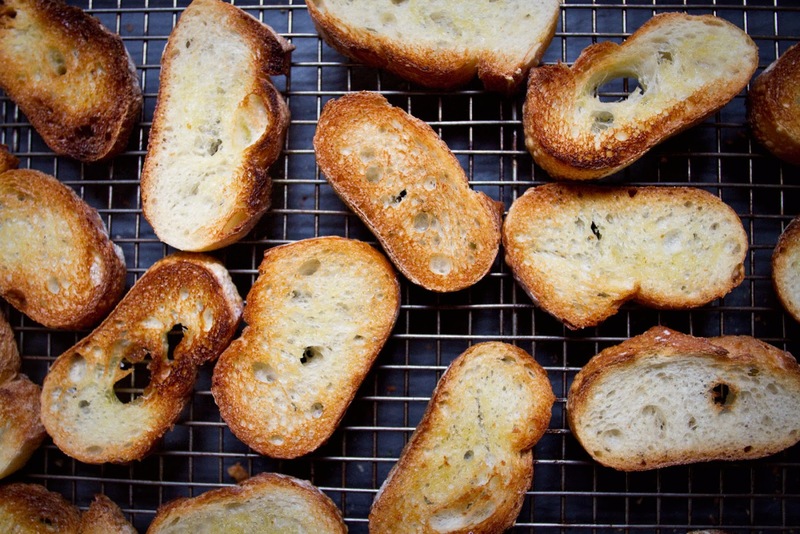 Slice the baguette into pretty thin slices and brush each slice with a small amount of olive oil. Place on a rack and toast in the oven alongside the garlic, about 3 minutes, or until the toast is nice and golden brown. Keep an eye on it to prevent burning. 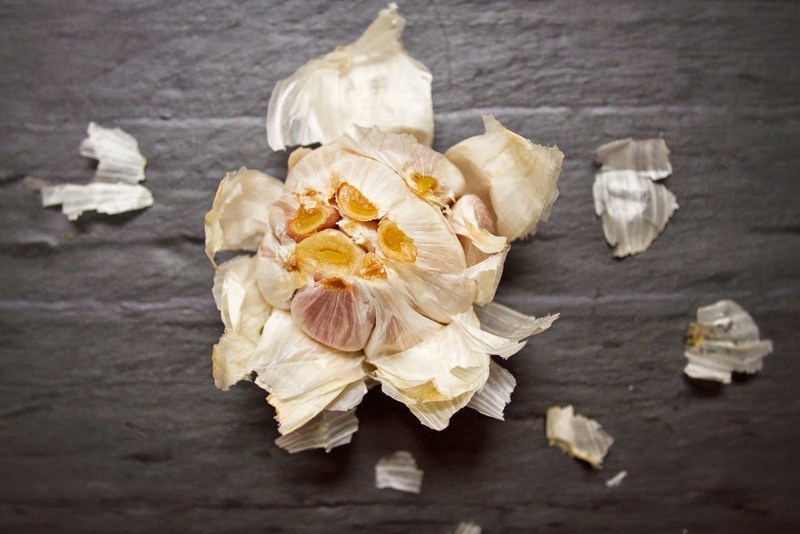 When garlic is roasted through (the cloves will be soft and brown), remove from the oven, unwrap, and set aside. Turn oven down to 350 degrees fahrenheit. 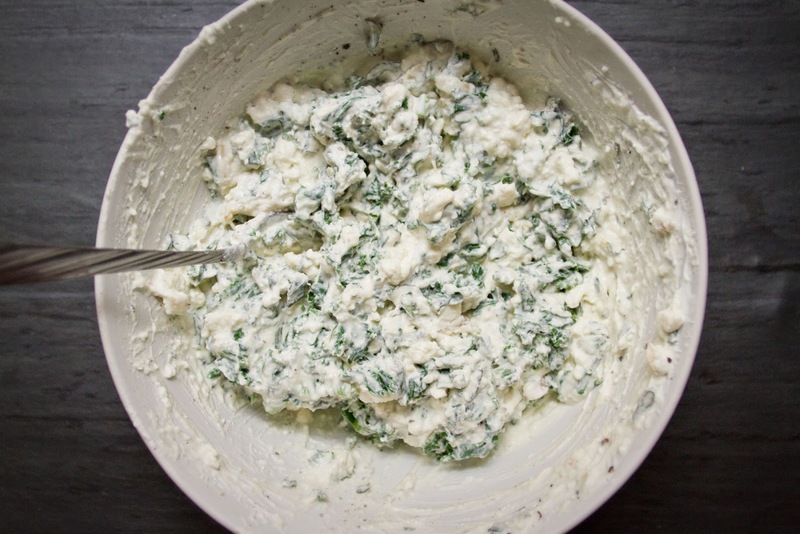 Thinly slice the basil and crumble the feta, set aside. 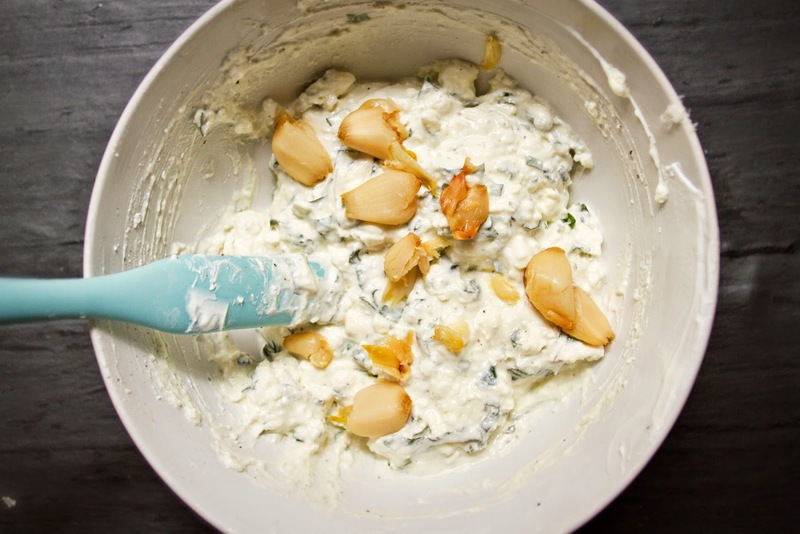 In a large bowl mix the greek yogurt, olive oil and cream cheese, once smooth, add the cloves of roasted garlic. I squeeze mine to remove them from their papery skins., but peeling is also easy. Mash and mix the garlic into the dip. Add the feta and 1/2 the Romano cheese, and mix well. Fold in the basil and kale until well mixed. 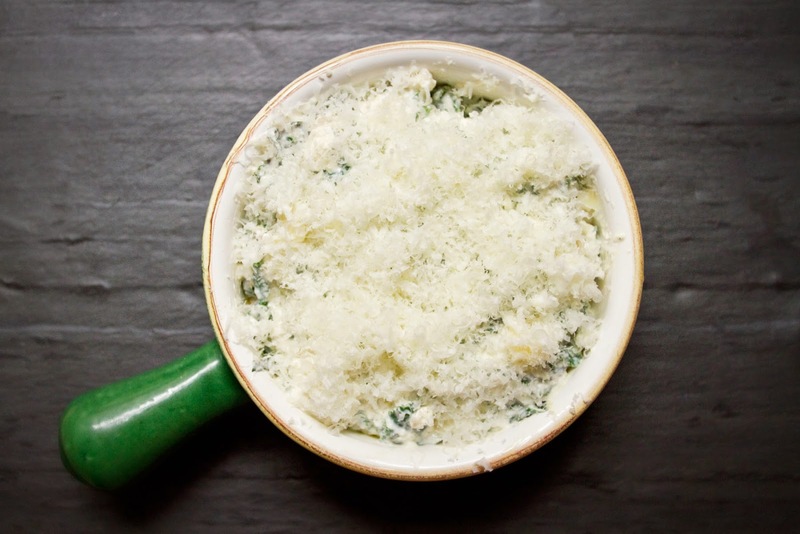 Spoon the dip into an oven safe dish and top with the remaining Romano cheese. Bake in the oven for 20-30 minutes, or until bubbly and hot. Finish under the broiler for 3-5 minutes if you'd like to brown the top. 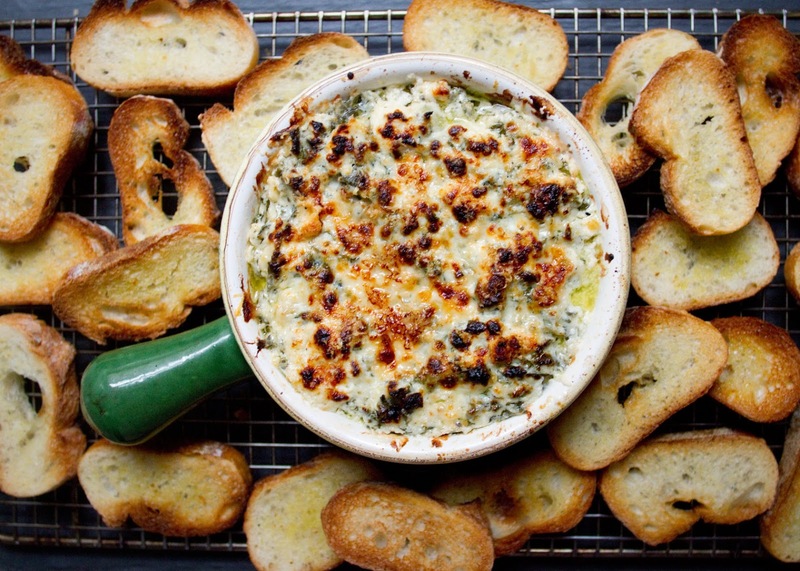 Serve immediately with toasted baguette.